Whether you live on Maui or are here on vacation the farmer’s market is something worth exploring. If you come to Maui for vacation be sure to include the farmer’s market as a must do activity, especially if you are a foodie like me. Not sure? Read on, give me a chance to convince you that there is a reason the farmer’s market is the place the locals really go. 1. No Carbon Footprint – Almost no fossil fuels are used in transportation of local produce to the farmer’s market. Maui is about 2,400 miles from the Mainland. Fuel consumption for food to travel by air cargo from the Mainland to Maui creates an obscene carbon footprint compared to the 15 minute drive from Kula to Pukalani in a van or pick-up truck. No packaging! If produce is needing to be bundled, take kale or chard for example, some of the Maui farmers use the biodegradable stringy material from a banana tree to create bundles. Brilliant! Bring your own basket or bag. In fact, bring more bags than you think you will need. I often have to make two trips back and forth to my car because I find so many amazing things to try. And I have a family of only two! 2. Support a local Farming Family – Farming is often a family affair on Maui. In my experience samples are shared enthusiastically. Farmers are excited to share information about what they are growing. They will share recipes with you and offer suggestions on how to prepare a vegetable you may have never tried if you had seen it at the grocery store. Exploring the Farmer’s Market is a more enjoyable way to shop. It is always nice to breathe the fresh air and meet new interesting people, especially on Maui. It is even a great experience in the pouring rain when you may find yourself seeking shelter with some amazing people you otherwise would have never met. You could find yourself in your own personal meet-cute, the kind you only see in the movies? 3. 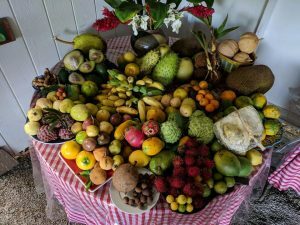 Get Fresh – Get the freshest, most nutritious and reasonably prices on fruit, veggies, freshly pressed Sugar Cane juice (while you wait), coffee, kombucha, coconut kefir,, orange juice, macadamia nuts, honey, fresh fish, eggs, and prepared food available. Farmer’s Markets offer the best selection too. Maui, with the 17 microclimates, provides a wide array of fruit not available most other places. The fresher the produce the more nutrition packed inside. I am not a fruit scientist, but to me it makes sense that a Maui grown Banana from the farmer’s market is better for my body and the environment than the bananas that other stores offers that are transported from somewhere in South America and wrapped in plastic. Having read every word above, I am sure you noticed this list is packed with far more than “3” reasons to shop at the farmers Market. Since Haiku is the place I call home, Upcountry Farmer’s Market, (near Long’s Drugs) in Pukalani, is where I love to go. It is open from 7:oo am until about 11:00 on Saturday mornings. I say about 11:00 because the farmers sell everything they bring, and when it’s gone – it’s gone! Be early to get the best Maui has to offer. This is a very popular market. Check out more farmers markets on the island Here. More about Sugar Cane Juice – Go see Reba and Devin from Birds with Arms Farms. If you have never had fresh pressed sugar Cane juice, I strongly recommend it. Tell them Erika sent you! The picture above is from Ono Farms. They offer weekly Rare Fruit Tasting Farm Tour which includes tasting rare exotic fruits, chocolate and coffee! I hope you are having a blessed day. Please check back with ConsciousMaui.com often for daily weather and surf reports. We also share current events.